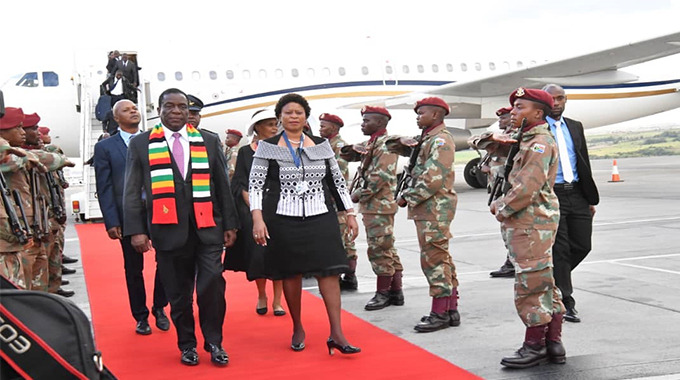 PRESIDENT Mnangagwa arrived in South Africa yesterday for the Sadc Solidarity Conference with the Saharawi Arab Democratic Republic (SADR) at which regional leaders are expected to express support towards de-colonisation and right to self-determination of the people of that country. The President is accompanied to the conference by Zanu-PF chairperson Cde Oppah Muchinguri – Kashiri, secretary for administration Dr Obert Mpofu, secretary for external relations Cde Simbarashe Mumbengegwi and secretary for youth affairs Cde Pupurai Togarepi. The SADR, also known as Western Sahara, is the only African country still under colonisation by fellow continental nation Morocco since 1975. “During the Solidarity Conference, the SADC Heads of State and Government will express the region’s support for de-colonisation and self-determination for Western Sahara on the basis of the values and principles that have guided the quest for independence throughout Africa,” read a Sadc Press release. The bloc also seeks to support SADR’s right to self-determination and independence based on the principle of self-determination and de-colonisation, through the holding of a referendum. SADC also wants to support SADR based on four principles of, “multilateralism and international legality in seeking a just, lasting and mutually acceptable political solution, which will provide for the self-determination and independence of the people of Western Sahara. Sanctity of inherited colonial borders in Africa and the right of peoples of former colonial territories to self-determination and independence as contained in the Constitutive Act of the AU.